In a medium frying pan, melt the butter over moderate heat. Stir in the garlic and then the shrimp, 1/4 teaspoon of the salt, and the pepper. Cook, stirring, until the shrimp are just done, about 4 minutes. Remove from the pan and set aside to cool. In a large bowl, combine the yogurt, the mayonnaise, if using, the jalapeño, cucumber, dill, scallions, paprika, and the remaining 1 1/4 teaspoons salt. In a large pot of boiling, salted water, cook the rotelle until just done, about 12 minutes. Drain the pasta, rinse with cold water, and drain thoroughly. 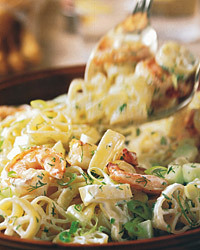 Toss with the yogurt sauce and the shrimp and garlic. Rinsing Pasta Never rinse pasta that you will be saucing and serving right away. Cooked pasta is covered with a thin layer of starch that helps the sauce cling to it. If you're making a salad, however, it's better to rinse this starch off to avoid gumminess when the pasta cools. The acidity of the yogurt and the strong herbal qualities of the dill will pair well with a high-acid white wine such as a Muscadet de Sèvre-et-Maine from France. As an alternative, try a reasonably priced sparkling wine.